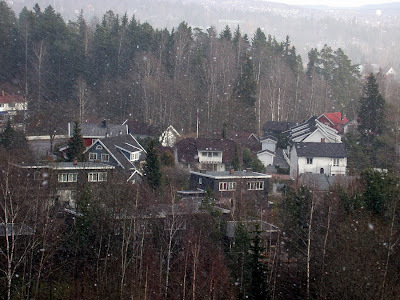 This is an old photo, but it does snow in Oslo and it may seem like the beginning of December will be white. Unless it starts to rain again, as it often does. 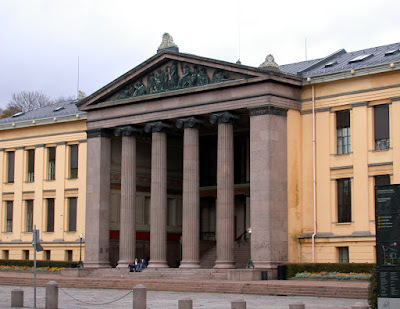 This is the old university in the center of Oslo, not far from the royal palace. This is where the juridical faculty is situated. The other faculties are in the new university, situated at Blinderen. I think the old building is very beautiful. The university was built in 1852. Behind the pillars you'll find the ceremonial hall, decorated with huge paintings by Edvard Munch. It's often used for concerts and other solemn ceremonies. The parliament used the university as their meeting place before the parliament building was finished in 1866. The mall prepares us for Christmas! 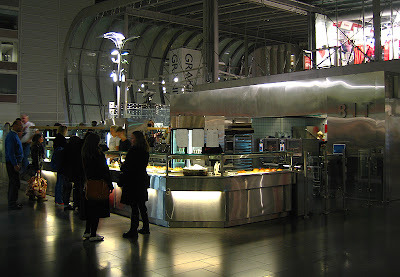 This picture is taken at one of the malls in Oslo. 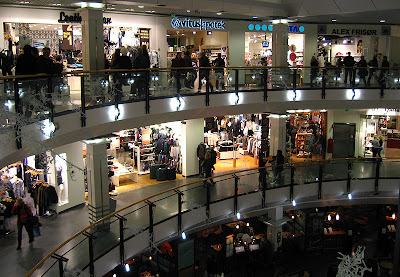 This mall is called Oslo City. 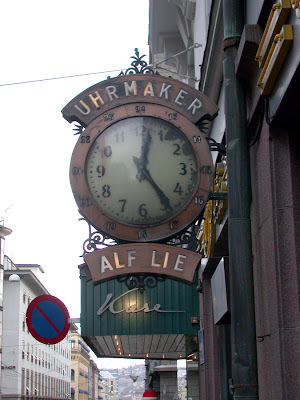 This must be quite old, at least they've written watchmaker in an old fashioned way. The modern way of spelling it is "Urmaker". Some more about transportation in Oslo. As I've mentioned we have a great subway system (although it definitely needs some modernization). In addition to the subway, there are several busses to take you "everywhere". 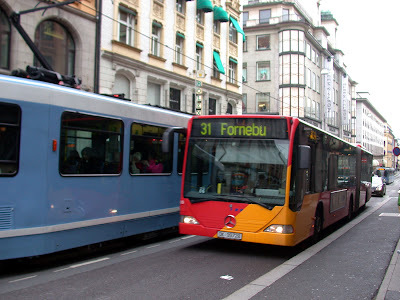 The blue tram is mostly used for transportation in the central parts of the city. Another photo from Karl Johan, this time closer to the royal castle. This is right next to the national theater (which you cannot see in the photo, but is further to the right). 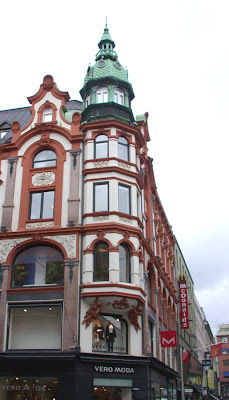 The darker building straight ahead (with the little "tower") is where you can find Hard Rock Café Oslo. 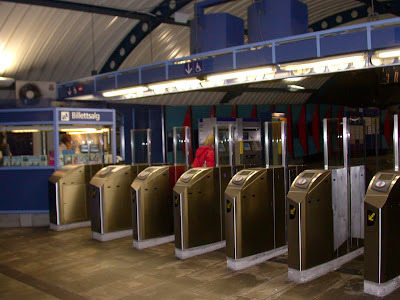 This is the last photo from Stortinget subway station. 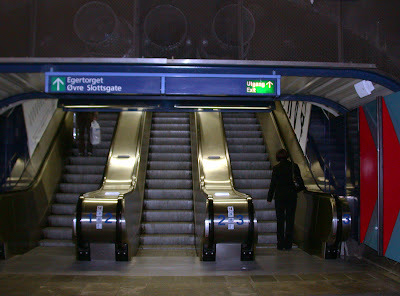 This is the escalator that brings you out of the station and up to street level. 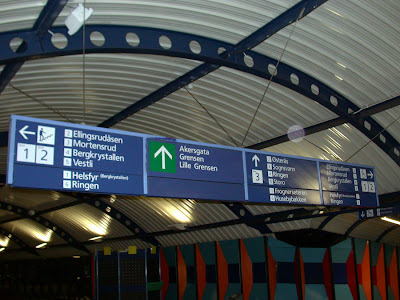 This is also from the underground station at Stortinget. 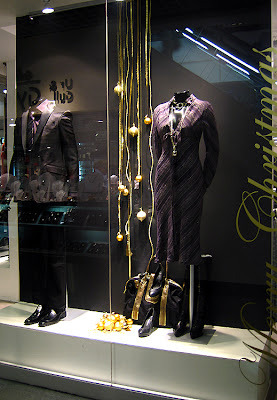 The decoration is not very pretty, in my opinion, but gives a cool effect. What do you think? 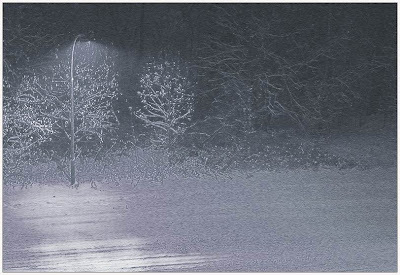 This is from Stortinget subway station. 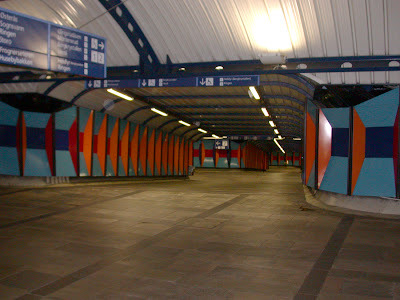 It's a huge place where all the city's different underground routes meet. From here you can travel to all parts of Oslo. 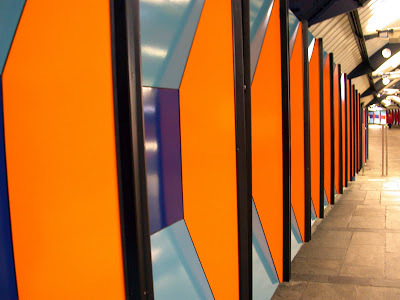 This is from the underground station "Stortinget" in Oslo. Stortinget is the name of the Parliament building and this station is right next to it. The poster says: "The right to a language - children, young, adults and elders". Deafs want the same right as hearing to an education, to participate in the society and the right to live in a home for elderly where others speak your language (the sign language). My support goes to them. These are more photos from the demonstration I told you about yesterday. The building is the parliament in the center of Oslo. Some politicians were there, listening to the demands of the deaf demonstrators. No promises were made, though. A few days ago there was a procession of demonstrators on Oslo's main street, Karl Johan. They were there to tell the politicians they want their language to get a higher status in Norway. And the language is the sign language. There are 5000 deaf people in Norway and 20.000 who use the sign language. Deaf people want to have the similar possibilities in life as hearing people; they want to be able to choose the education they want, to take part in society like everybody else, to watch television programs etc. The sign language is accepted officially as a language in countries like Germany, Belgium and New Zealand - but not in Norway. These people want the right to communication, but the politicians say it's too expencive. Hopefully these demonstrators will be heard. The next couple of days I'll submit a few more photos from the demonstration, to show my support. In this photo you see the royal castle in the distance. The building on the left is the parliament building. 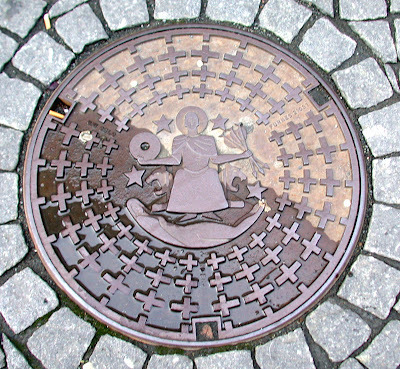 This is a manhole with the symbol of Oslo on it. It's Saint Halvard, the patron of Oslo. 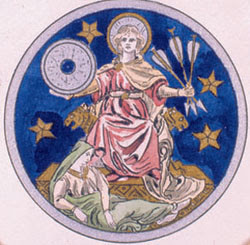 In his hand he's holding the three arrows that killed him and the millstone his killers used to sink him in the sea. He sits on a throne with lion heads and before his feet lies the woman who symbolises the victim he tried to save. The story is that on May 15th in the year 1043, a woman was accused of stealing, but claimed she hadn't. She tried to escape and begged a young man, Halvard, to take her on his boat across the sea. He believed her and helped her, but the followers soon reached them on another boat and accused Halvard of helping a thief. He wouldn't listen to them, so they shot him with arrows and then beat the woman to death. To cover up the murders, the woman was buried near the beach and Halvard was dumped in the sea with a millstone around his neck. But his body floated and was found. Later, at his grave, there were reported several omens. Halvard was martyrized as he had died trying to save an innoncent woman, and was eventually named a saint. His remains were later placed in a silver shrine and placed in the Maria church in Oslo. 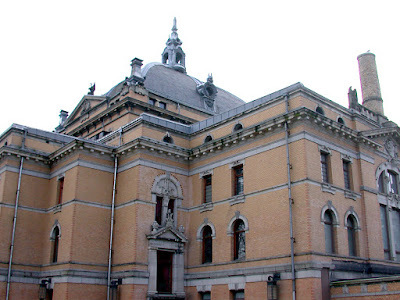 In the year 1130, the new Saint Halvard church was built and the holy shrine was moved there. These are the little cherubs or angels from yesterday's post. They look like they're supporting the building. Quite beautiful, I think. 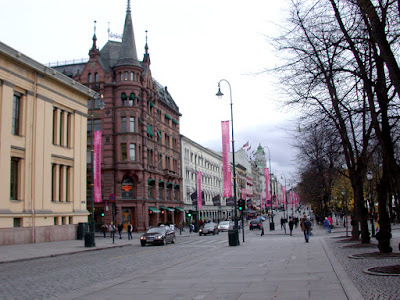 Oslo's main street is called Karl Johans gate (K J's street) and goes from the main railway station and all the way up to the royal castle. I don't go there often, but when I do I always take the time to admire the buildings. I love these old houses with many details. Especially those with towers like this one. 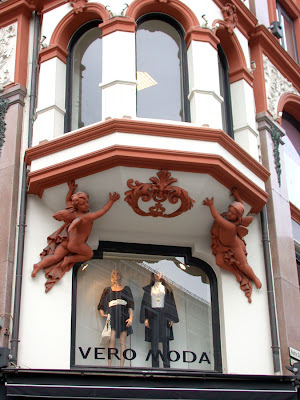 Tomorrow I'll show you a closer detail of the two cherubs or angels that decorate this white and red building. 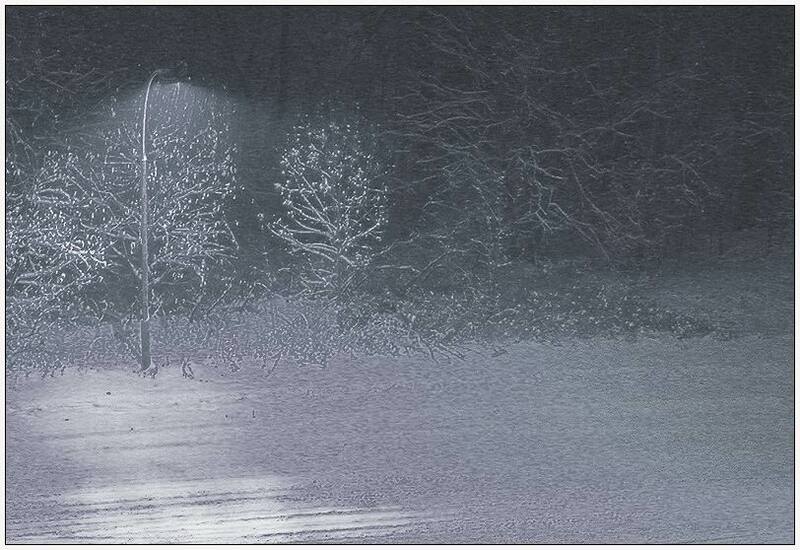 This is a small park outside of the national theater (from yesterday's post). The golden statue is quite new. 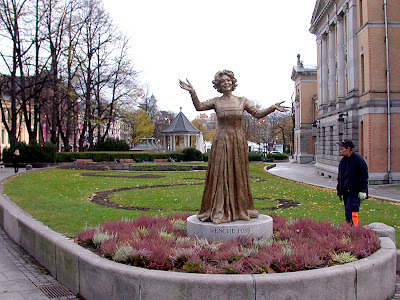 It's a statue of Wenche Foss, one of Norway's most famous and beloved actresses for several decades. Her son, Fabian Stang, just recently became the mayor of Oslo. This is the national theater in Oslo. It opened at September 1st in 1899. 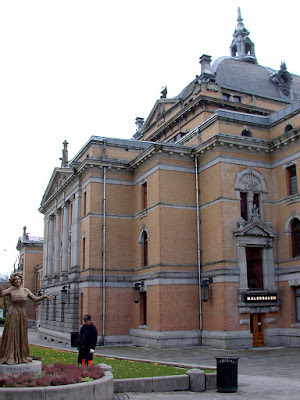 The first manager of the theater was Bjørn Bjørnson, son of the famous Norwegian writer Bjørnstjerne Bjørnson. This is the same fountain as in yesterday's post. Just a closer look. 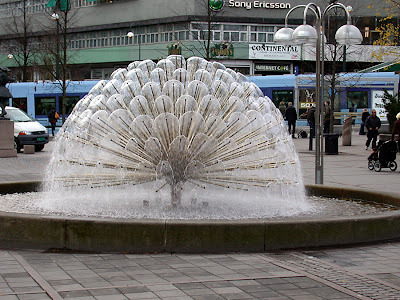 This is the fountain near Nationaltheatret (The national theater), in the center of Oslo. I'll show you the theater later. 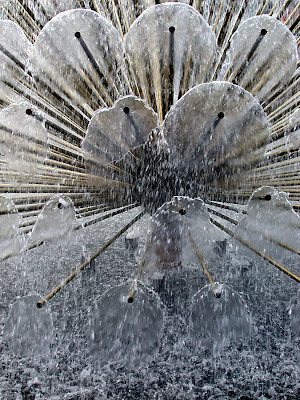 The fountain is situated behind the theater, just outside of the entries to the tube and the train staion. Busses and trams are also easy to access here, you can see the blue tram in the background. 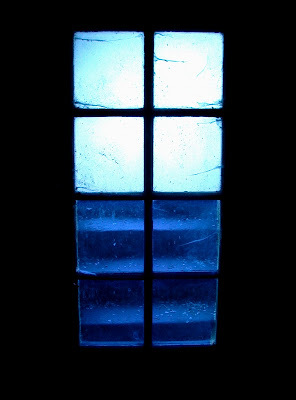 Currently, 121 Daily Photo sites are participating in the 1st November theme: The Color Blue. Please use the links below to visit them.